Respond to natural and man-made disasters to provide search and rescue, medical support, damage assessment, and assist in the coordination of relief. What is South Carolina Emergency Response Task Force? is a state resource governed by the Firefighter Mobilization Oversight Committee. It is located on the campus of South Carolina State Fire in Columbia, SC as part of the Division of Fire and Life Safety under Labor, Licensing, and Regulation (LRR). is capable of responding to any location within the state. This team will normally function within the existing incident command system established in a jurisdiction as an operational incident support function. The team is also available for response to jurisdictions outside the state as part of EMAC. is designed for rapid deployment in an emergency. All SCERTF members must meet a minimum four-hour response window for mobilization. is designed to provide critical incident management assistance to local emergency response agencies outside their scope of practice or magnitude. The team has the assets to manage for up to 14 days. personnel work with the local incident commander (IC) to evaluate the situation, perform a hazard assessment, and determine what assets and resources should be allocated for the incident. Depending on the immediate needs, the responding Task Force can be divided into two groups, each operating in 12-hour shifts on a disaster scene. Task Force members must be sufficiently cross-trained in search and rescue skill areas to ensure depth of capability and integrated Task Force operations. is equipped with a cache worth over $5 million, which includes more than 15,000 items and weighs in excess of 25 tons. The specialized equipment includes; hydraulic jacks, rams, shoring, high-tech listening devices, hazardous material monitoring equipment, victim location devices, breaching, breaking and lifting equipment, and specialized medical and triage equipment. is a state plan to assist any fire department in the state with resources if an event such as a fire, rescue, terrorism attack, hazardous materials event, or natural disaster occurs that cannot be handled by the local department. does not take the place of any local mutual aid agreements but only enhances them by providing statewide aid. take a declaration of a State of Emergency by the Governor. Learn more about the HazMat Working Group. 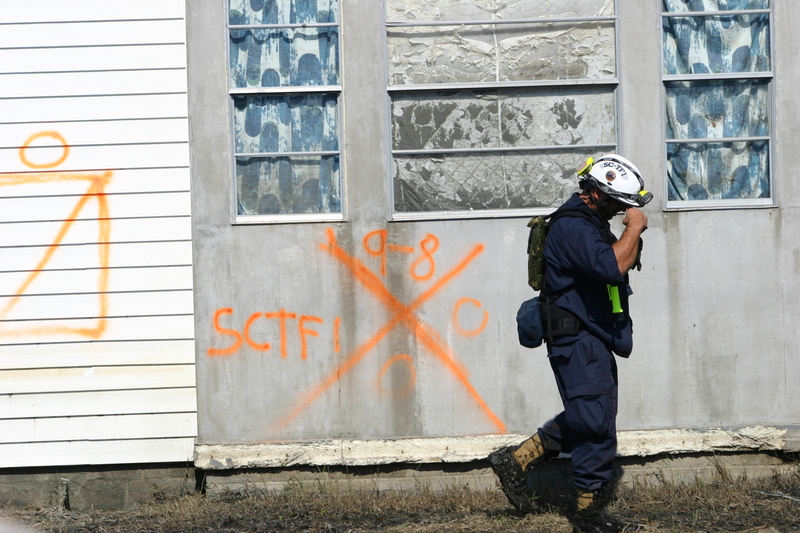 is a Search and Rescue team (SC-TF1) providing a coordinated response to disasters in urban environments. Emphasizing location and extrication of victims trapped in largely populated areas, the Task Force is capable of responding to State and National disasters including earthquakes, hurricanes, widespread tornadoes, and man-made technological and terrorist events. is comprised of personnel divided into three Task Force groups throughout the state. These personnel represent many emergency service organizations throughout the state. Download the application to join SC-TF1. is a collaborative effort between the State Urban Search and Rescue Task Force (SC-TF1) under the direction of S.C. LLR, Office of the State Fire Marshal, S.C. Emergency Management Division and the Army National Guard Aviation Unit based at McEntire. has trained professional rescuers from SC-TF1 and highly-trained pilots and crew members from the Army National Guard and made them a cohesive unit capable of performing helicopter rescue using the UH-60 Blackhawk and LUH 72 Lacota. is available 24/7 and responds at no cost (in state) to the requesting agency. Call the State Warning Point at 803-737-8500 to request this team. Average response time is 90- 120 minutes. The S.C. Emergency Response Task Force continues to provide initial and long-term responses to natural and man-made disasters. The program’s primary focus is to provide immediate resources to local and regional fire service agencies. 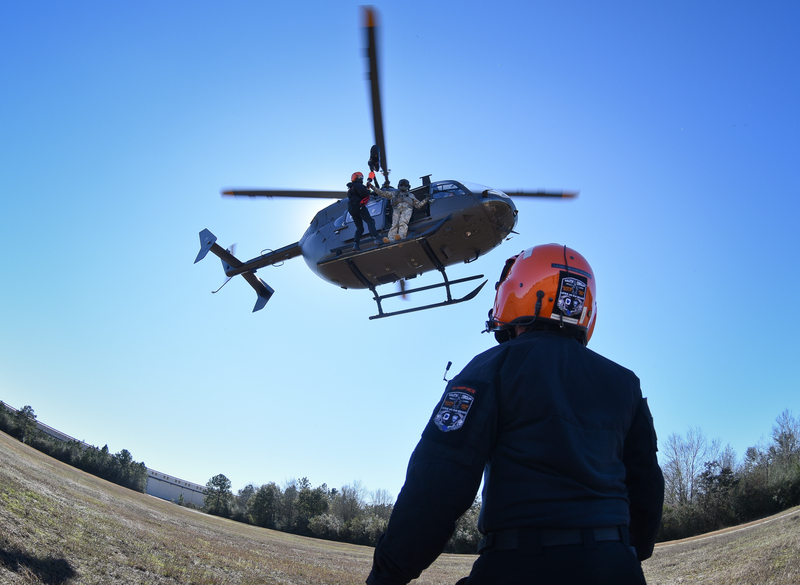 We continue into our eighth successful year of partnering with the S.C. National Guard to offer a statewide helicopter rescue program. This asset is one of few in the country, and is responsible for rescuing 26 people during the North American Storm Complex of October 2015. In October 2015, South Carolina was faced with a “1,000 year” flooding event. Our state had not seen a natural disaster of this magnitude since Hurricane Hugo in 1989. During the course of nine days, 49 members of South Carolina Task Force 1 participated in numerous rescue and reconnaissance missions. Per S.C. Code of Laws (23-49-10), this statewide mutual aid assistance agreement can be utilized by the state’s 46 counties. The system allows for firefighting and rescue resources to be effectively and efficiently moved throughout the state to assist during a local, regional, and statewide disasters or emergencies. In November 2015, several long-time members of the team departed after many years of valuable service. The State of South Carolina is thankful for their service, and legacy, as the program continues to refocus and make plans for future expansion and growth. In addition to the partnerships mentioned above, fire service recruiting continued, including the annual recruiting drive at the 2016 Fire Rescue Conference. In FY 2016, new partnerships were fostered to further grow the Task Force. Relationships were made with the South Carolina State Guard and local agencies in order to increase capacity and membership. The Task Force continued to train in each quarter of FY 2016. To focus on rescue and team basics, Task Force leaders launched a “Core Competency” initiative. More than 1,800 man hours were spent on FY 2016 team training exercises. An additional 600 man hours were spent attending scheduled events and meetings.